Hi. Will you be doing anymore open weekends this summer? Would love to do a flight on Sunday. As we cannot pre-book slots, how will the day be run. Is there a ‘best time’ to arrive and how long should we expect to be there. What time does the Open Day start & finish today & tomorrow? Thank you, looks great! 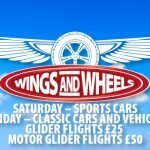 do we need to purchase and book for gliding on the sunday? We will be taking booking slots on the day Jenny. How much will the flights cost? Glider flights will be £25 Judith. Sounds great can we do a flight or two Sunday morning? Hi Matthew, we will be looking to begin flying between 0930 and 1000, depending on the weather, and glider flights will be approximately 12 minutes each.